OUR TOWN–The simple story of a love affair is constantly rediscovered because it asks timeless questions about the meaning of love, life and death. In the final moments of the play, the recently deceased Emily is granted the opportunity to revisit one day in her life, only to discover that she never fully appreciated all she possessed until she lost it. “Oh, earth, you’re too wonderful for anybody to realize you,” she says as she takes her place among the dead. Congratulations to the cast, crew and director of the community production of Our Town at the Sandwich Town Hall last night. They played to a packed house. If there are any tickets left for this afternoon’s matinee, grab ’em up. Nice job done by all…big parts …little parts…thank you all. Sold out at Our Town…great 2nd night performance! Pamela Wills: Great show Melinda, et al, we loved it!!! Shelly Janczak: Loved it…. Wiped tears at the end. Denise Dever: Great show Melinda. I really enjoyed it..wonderful cast! I’m with Shelly…tears as well! It was directed by Sandwich resident Melinda Gallant and was produced with over 20 Cape resident cast members as an event for the Sandwich 375 celebration. Wicked Local photo by Emma Gauthier | From left: Janet Moore as the stage manager and shopkeeper, Hannah Carrita as Emily Webb, and Daniel Souza as George Gibbs. “People always ask me, ‘Is there any professional theater on Cape Cod, or is it all amateur?’” says Carol McManus, a Sandwich resident and proud local theater actress. She sometimes gets a little annoyed with the question. “People want to see good theater, which might translate to professional theater for them. But by and large, community theater is excellent on the Cape and Islands,” she says. 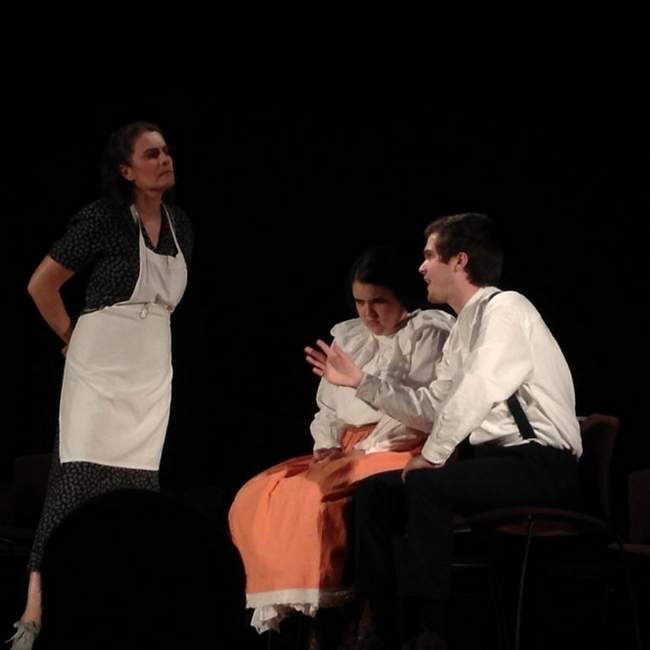 McManus recently played Mrs. Louella Soames in “Our Town,” a three-act play written by Thornton Wilder in 1938, about Grover’s Corners, a small town in New Hampshire. It details the daily life of its inhabitants — through birth, marriage, and death — and asks the audience to consider the value in what they might see as their own mundane lives. “Our Town” is the definition of a community theater production: local folks of all ages getting together with a vast array of experience and a limited budget to put on a couple of shows in a very short amount of time. Most cast members work full days and then attend rehearsal at night, working some more to perfect their roles. The cast members for this production of “Our Town” only had about five or six weeks to rehearse, with three rehearsal sessions per week, says Gallant. Even though they all come together for the curtain call, their reasons for performing at the local level are rather diverse. Pat Ferrell of East Falmouth has been involved in several aspects of community theater for over 30 years on Cape Cod, including acting, directing, and costume management. She says that she loves the wonderful people she gets to work with. For Hannah Carrita, community theater is a passion as well as a stepping stone for her future career as a Broadway actress. At 19, she’s already performed in over 30 shows, predominantly in musical theater. “I always liked being the center of attention and, as I got older, I liked being someone else for a change,” Carrita says. She says “Our Town” was her first non-musical show, adding that there was “something special about the cast” and that “there was a lot of trust between everyone.” Carrita also enjoyed learning from more experienced cast members who were in Broadway and film. Janet Geist Moore, who played the stage manager in the production and has been involved in film, Broadway and TV in the past, says this was one of her first experiences with community theater. “I didn’t have many expectations, but I was pleasantly surprised with everything,” she says. Compared to her experiences in larger productions, she says that the main differences were with the budget for costumes and set design and with rehearsal time. In smaller performances, there was only about three hours a week of practice, as opposed to six or more with professional acting, she says. McManus has been a part of her fair share of theater guilds and acting groups throughout her 30-year acting career and encourages those who are interested in trying theater in any way to try it, as different organizations are always looking for people to get involved.